High on the list of 2016’s tech buzzwords: conversational. Some heralded this year as “the year of conversational commerce,” while others wrote extensively on the power of conversational interfaces. And then there are bots, bots, and more bots (which are, by their very nature, conversational). But as 2016 draws to a close, most things we do are still not that conversational. Yes, you can order an Uber through Facebook Messenger. And Quartz’s app brings you the news in conversational format. Not quite the revolution we were promised. In practice, it seems most of these instances of conversational interfaces are gimmicks, more tailored at generating marketing buzz than improving usability for the user. The user experience with these interfaces is often clunky, slow, and less intuitive than a traditional GUI. 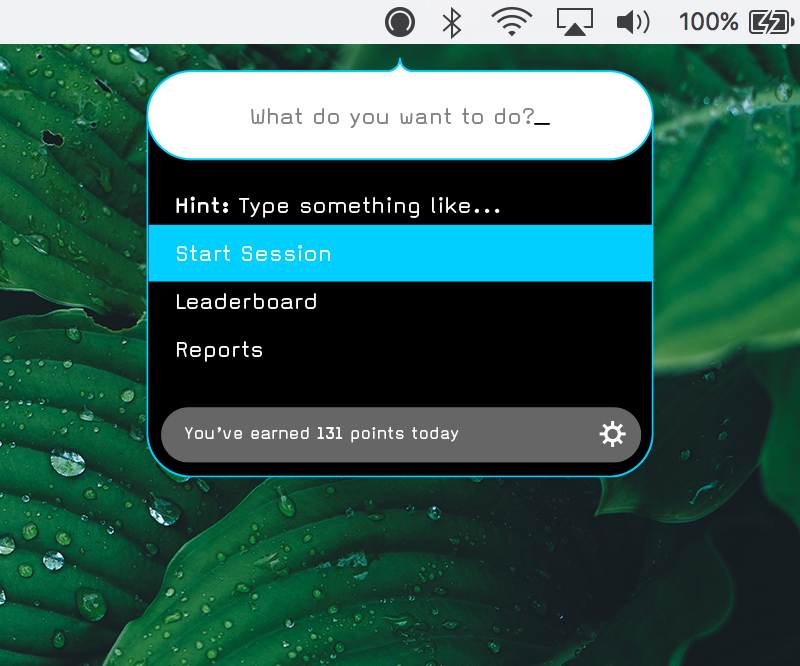 At Saent, we also added a conversational interface to our desktop application this year. We didn’t do it to follow the latest trend or garner press mentions. We pursued our conversational UI because we believe it’s the best way to fulfill our product’s purpose: help our users focus and live more balanced lives. Our product managers, designers, and developers have been working with this UI for over a year now. Some aspects worked out as we expected, others didn’t. Below is an overview of the key things we’ve learned so far. Our current UI presents users will specific options. 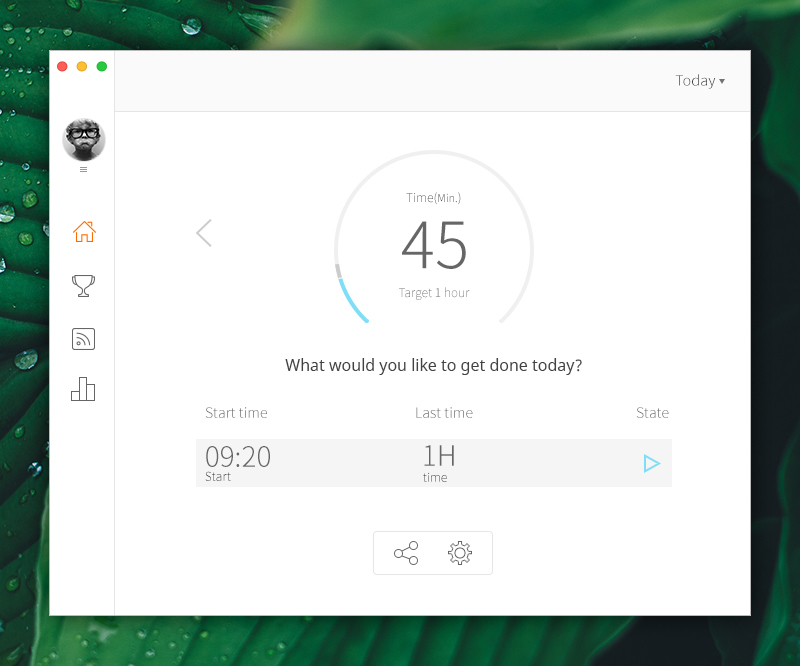 Here is the “start session” screen, which allows users to select specific amounts of time. One early concept for our conversational UI allowed users to launch app features using a Spotlight-style open input box. While we love the idea of the open text input field, we opted to provide users with a specific set of multiple choice options. That decision came down to usability and figuring out the best way to use the medium. Open text input fields are like interactive movies in the 90s. The idea sounds great on paper—you are in control of what happens and can influence the outcome of the story!—yet it overlooks why people want to watch a movie in the first place: to relax and to not have to think. If they want interactive action, they can play a video game. Interactive movies never took off because they’re a misuse of the medium. So it is with the open text input field. People already have lots of decisions and choices to make throughout their day. An open input field presents them with another huge challenge: What do I choose to do next, out of all the gazillion options modern work and life have to offer me? We think user interfaces should always simplify choices for the user, not add to their burden. By presenting a few, relevant options, instead of an unlimited choice in the form of an open input field, Saent becomes easier to use rather than creating further decision fatigue. Based on feedback and user numbers, we believe that choice was correct. With the previous idea in mind (presenting our users only with relevant options) we went a step further: What if certain menu options only showed up based on specific parameters? For example, our early beta testers reported Saent’s Leaderboard sometimes became a distraction; they couldn’t stop checking it. While we were happy to find out the Leaderboard concept actually works, Saent should never be a distraction (we exist to help people focus!). So we started hiding the Leaderboard option if users had visited it in the past four hours. And we started doing similar things for other options: only show the Take a break button if the user had not taken a break for at least half an hour. Show Categorize (where users marked apps and sites as Good or Evil) only when the user visited a new site, and so on. But it didn’t work out well. Our users didn’t understand why a certain option would sometimes be shown and not at other times. But even more importantly, with constantly changing buttons, there was no semblance of anything close to a main menu (or “home base”). Providing users with a set of anchored, standard options—a “home” screen—creates a more consistent user experience. Another important reason for us to implement a conversational UI was to give Saent a distinct personality. We’ve always thought of Saent as a person—a friend who is there by your side to help you do great work. The first version of the Saent app had little room for personality. Even our rather clunky first try at a conversational interface revealed to us the power this type of UI has in forming personal connections between app and user. Proof that this really works was revealed to us through a bug. At the end of a focus session, Saent either compliments you (in case of a successful session) or motivates you (in case of a failed session). However, in our earliest version, Saent was quite negative after failed sessions and would kind of scold users. Then we shipped a version where a bug gave this negative copy to users who had actually successfully completed their sessions. It didn’t take long for complaints to start pouring in. Many users were upset and talked about Saent as if it were a real person who insulted them! Over the past year, we’ve experienced many more of such instances indicating the conversational, text-based format really is a great way to create personality within your app. It’s easy to continually add new copy to keep the conversation fresh, exciting, and surprising (or whatever your brand values are). Since a conversational UI rests more on its copy than on its visuals, producing new interactions (and sometimes even entire features) is a lot easier than when everything is extremely visual. The conversational UI allowed us to develop a standard design language that makes extending the app with new interactions and features through scriptwriting a simple process. 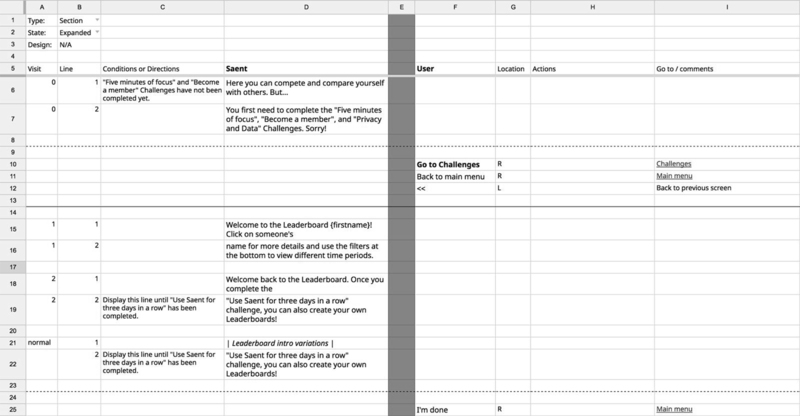 Each sheet represents a different step in the interaction, and buttons contain links to the relevant spreadsheets that represent the options presented by the buttons. This greatly speeds up development of new interactions, as the copywriter can work directly with the software developers, instead of having to wait for a visual designer in between. This frees up designers to spend time tackling more complex UI and UX issues. While we haven’t gotten there yet, this idea can be taken one step further. We’re planning to translate the spreadsheet format to an in-app editor that will allow the copy writer or UX designer to instantly create new interactions using text and predetermined triggers without any need for software development. 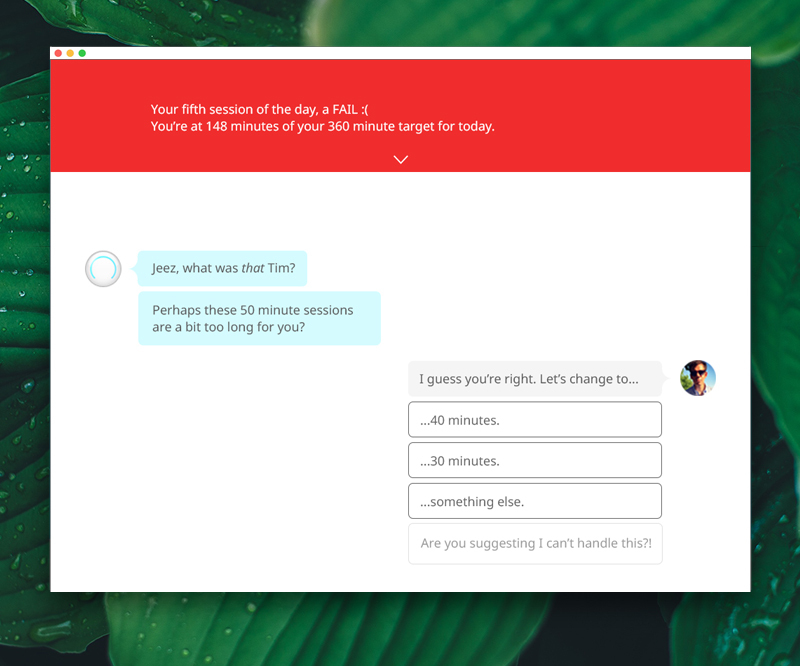 Taken to its extreme, the user might even be able to add their own interactions at some point (e.g., use the editor to have Saent ask you a specific question in the morning, like “Did you brush your teeth?” if that’s of particular concern to you). This ease of development is also presenting itself in the chatbot world, with the explosion of easy-to-use chatbot development tools. For app developers, a conversational, text-based UI can offer an invaluable level of speed and ease to push out new interactions and features, freeing your development and design teams to tackle larger issues and projects. As you can see from the previous spreadsheet example, our conversational interface is currently still pretty dumb. It’s basically a long string of interconnected multiple choice questions, made slightly less dumb by certain parameters and “If… then…” statements. Using our conversational interface, the Saent app of the future will be able to deliver highly personalized and intelligent experiences for our users. Yet we believe our current conversational interface is the basis for an intelligent future. Without the user having to get used to any new features or interface conventions, we can hook up deep learning and natural language recognition to our interactions at some point in the future. Without changing much on the front end, Saent suddenly can become extremely intelligent in the back end. Closer on the horizon is another practical advantage of the conversational UI: localization. We’ve set up the back-end database in such a way that we can easily add in translations to other languages. Since it’s all copy-driven, all we have to do is get a translator to go through all the copy and we can launch a localized version for a new country quickly and easily. A conversational interface isn’t for everyone. I personally don’t believe it works for news (scrolling and clicking headlines is simply faster), restaurant orders, and other interactions where there are lots of (fixed) options to choose from, and the choice is not too complicated. In such a case, scrolling through a (visual) overview of available options is much more practical, not to mention faster. I’m also doubtful about open input fields that present the user with infinite choice, something that sounds great on paper (remember the interactive movie?) but in reality most people don’t like it. For that reason, and the fact that most of us are not longing for a return to MS-DOS, I’m also doubtful about chatbots being the future for mainstream users; most folks just don’t like to remember (slash) commands. But there are settings for which a conversational interface is a great solution. It’s about treating the medium properly and choosing the right UI for your app’s goals. In any setting where the user needs advice, assistance, encouragement, or motivation, a conversational interface is great. It provides room for creating a personality, you can take the user by the hand without making it feel condescending, and the interface can be made extremely intelligent based on the input the user is providing. For us it’s been a rocky ride getting it right, but overall we’re happy with our conversational UI and are continuing on this path, whether or not it’ll remain a buzzword in 2017! Want to try out Saent’s conversational interface? We’re providing exclusive access to the app for InVision Blog readers here. Tim Metz is the co-founder of Saent, which offers the world's first smart device and app designed to help you find balance, do great work, and live a more fulfilling life. You can download the beta app now for free. Tim lives and works from Beijing (China) and writes regularly about productivity, work-life balance, and entrepreneurship.